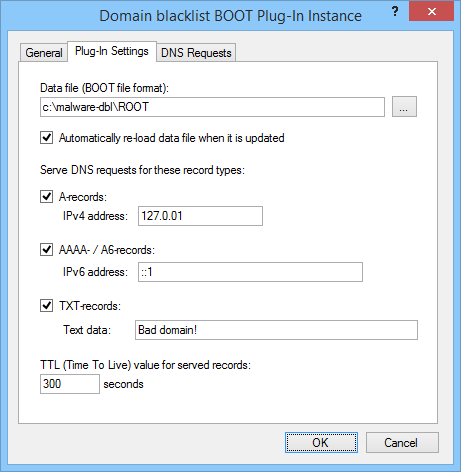 This plug-in blocks / redirects DNS requests for domain names listed in a standard DNS "BOOT" file. Specifically this plug-in was created to handle blocklists from http://www.malwaredomains.com - but can technically use any list of domain names in the standard BOOT file format. This plug-in is very similar to the Domain Blacklist Plug-in - except for data file listing the domain names. It reads the zone names for any primary zones listed in the BOOT file and ignores everything else in the file such as zone file names etc. 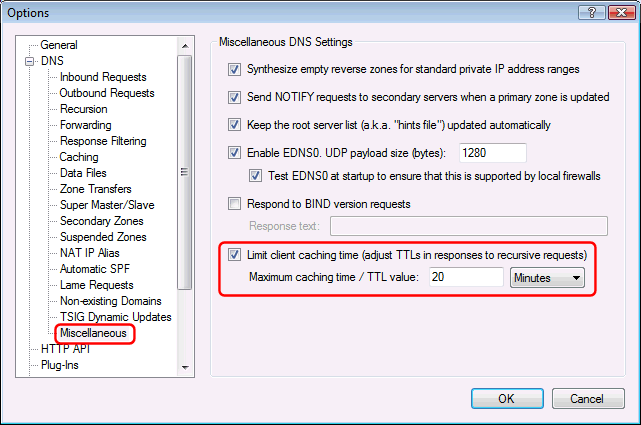 It will match/block requests for any domain name (including sub-names) matching these zone names. If you want to ensure that specific web-sites are not accidentally blocked (for example if you are using a blacklist data file created by someone else) you can setup a whitelist- see KB1286. If you want to relax blacklist restrictions at certain times - for example allow social networking web-sites after normal working hours, you can schedule when the plug-in takes effect - see KB1287. NOTE: Operating systems and Internet browsers cache DNS records, so if a user recently accessed or was blocked from accessing a web-site, this information might be cached locally on her computer for some time. You may need to restart all browser instances and type "ipconfig /flushdns" at a command prompt on the local computer before it will query the DNS server again for an updated result.